May | 2016 | Quintessential Jill: Life discoveries of a happy go lucky Californian. What Would Audrey Do? Exemplary life lessons learned from the Gamine. A few years ago, or maybe even earlier, someone said “May the 4th be with you so you can come 4th on the 5th” or something stupid like that. I’m not sure but I believe this had something to do with drinking a lot on Cinco De Mayo. Now, I adore Star Wars as much as the next Sci Fi geek, but please, that expression is SO last year. In my opinion it’s entered the LAME category. While everyone else is saying “May the 4th be with you” today I thought a celebratory homage was in order for Audrey Hepburn’s birthday. Fashion Icon and fellow embracer of her inner child, I have always adored this woman. When in doubt, grab a big hat, sunglasses, or both. You shouldn’t have to push that hat down onto your head. If you do, it’s too small. Once the hat is placed on your head, bend forward. If the hat stays, the fit is correct. If it falls, it’s too big. I wonder if Audrey was quoting my father on this one. I couldn’t agree more! Laughter is a key ingredient to a successful life. Not to mention it can cure ills. It really can! Finding adventure is imperative to happiness. I mean honestly, everyone has their own passions. Find yours and explore them. I love to travel and try new foods. I love the arts. It’s important we think outside the box. If we remain status quo, we’re not really living. Never forget the importance of some well deserved R&R. I think people often forget to take some time to replenish their soul. Or they are too afraid they don’t deserve that respite from the business of daily life. It’s so important to pamper yourself even if that’s just resting in your back yard, reading a book. We all deserve this alone time and should take it. How are we supposed to continue to help others, if we ourselves are tapped out and exhausted. Make sure to take a moment, every day, for yourself. That being said, don’t forget to lend a hand to a friend. Or even a stranger! Making the world a better place should be something for which we all strive. 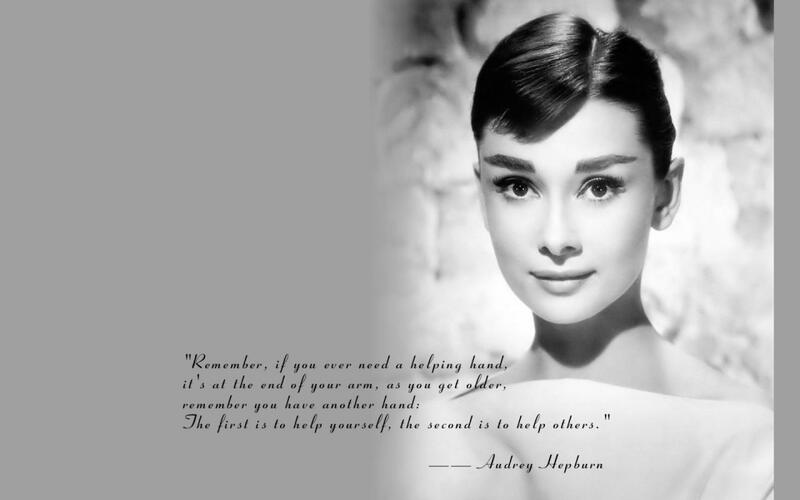 Audrey said “Always be the leading lady of your own life”. I think this means stay true to yourself and stand tall. Is it so wrong that I’ve made up my own life theme song? I think not. ;). Last week I embraced my inner-Audrey and decided to take an extended lay-over in Chicago. It was SO MUCH FUN!